Pack your bags, you're off to Thailand on August 16. 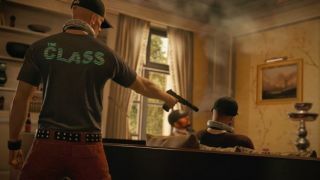 Agent 47 is off to Bangkok for Episode 4 of Hitman, it's been revealed. That's the Bangkok in Thailand, not the one in Alabama, and in your latest simulation sandbox you're attempting to murder the frontman of a fictional indie band, and also his family lawyer. Here's a music video for that fictional band, by the way, because it's 2016 and I guess that's what happens now. Hey, The Class aren't THAT bad, Agent 47. Available on August 16, Episode 4 will take place in and around a fancy hotel near the Chao Phraya river, and I've all my fingers and a few toes crossed that a dumb waiter can therefore be used in some murderous capacity. As if that wasn't enough Hitman news, the game's latest elusive target goes live today. You have 72 hours, or thereabouts, to murder The Broker in Paris, and nick his 'Ivory White' egg. Looks like a nice egg. Not £20,000,000 worth of egg, but nice.